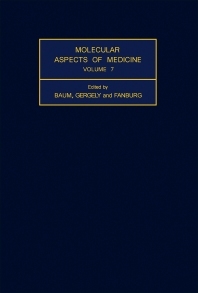 Molecular Aspects of Medicine, Volume 7 discusses diseases such as urolithiasis. Another term for this disease is calculosis. Urolithiasis occurs when stones are formed in areas such as the biliary, salivary, or renal systems, but it is found more often in the urinary tract. The epidemiology and etiology of the disease are extensively covered in the book. The second chapter focuses on the cell surface of healthy and disease-infected cells. Topics such as the plasma membrane, the extracellular matrix, and cell culture and transformation are also covered in the said chapter. The third chapter of the book is about the serum steroid transport proteins. This chapter discusses the biochemistry and clinical significance of the steroid binding proteins, albumin, and different binding globulins. The fourth chapter covers the physiology and pharmacology of emesis. The book concludes with a discussion on the mechanisms of pain and opioid-induced analgesia. The text can be a useful tool for doctors, medical technologists, students, and researchers in the field of medicine.